I remember when salad bars first became popular. For example, the amazing selection at the restaurant in the Columbia Mall Woodies. For whatever reason, I stopped going to places with salad bars. Probably because of getting Norwalk at a salad bar and buffet in Canada, ten years ago. It doesn’t mean I stopped enjoying that mix and match of salads, but these days I can do it at home. Thanks to having a CSA, a freezer and the time to make the salads. 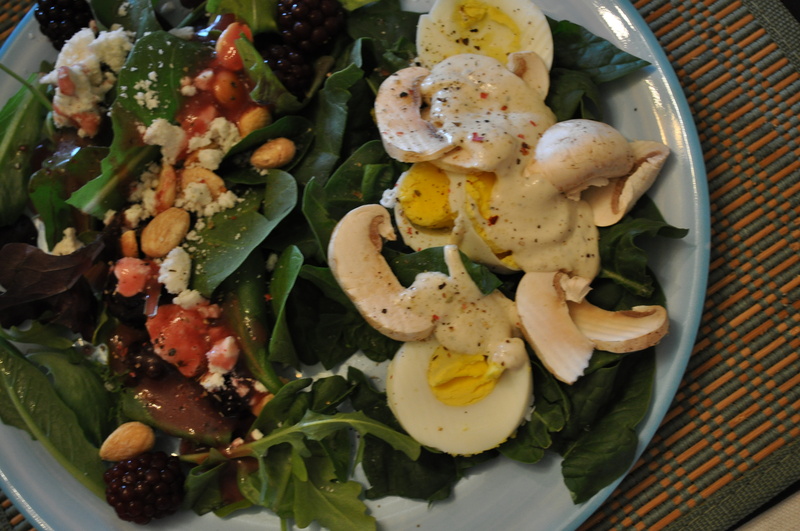 Today’s lunch was brought to us mainly due to the lovely greens from Breezy Willow CSA this week. Spinach and mixed greens, sitting in the fridge in their salad spinners. Mushrooms from the CSA too. And, a dozen hard boiled eggs this morning. Some for lunch today, some destined for egg salad, and a couple to grab and go before tomorrow’s hike at the Conservancy. 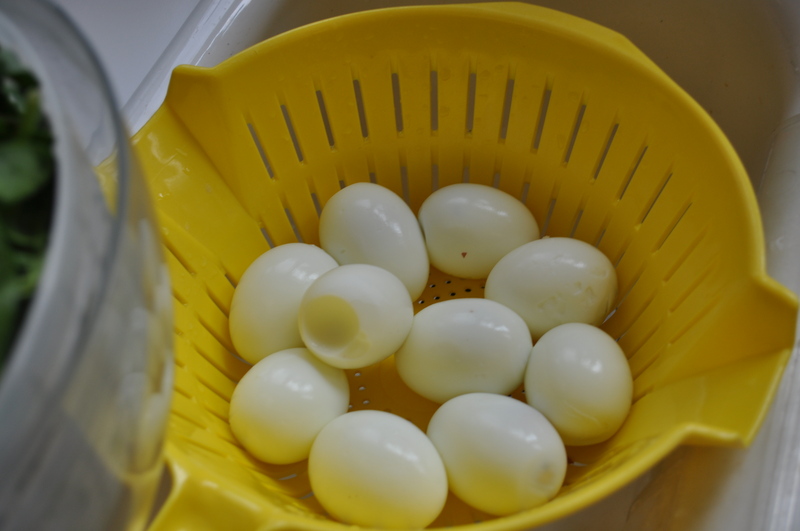 I hardboiled the first week’s dozen, now eighteen days old, and finally getting a little void that makes them easier to peel. We only have a dozen left now, and next week no eggs in the CSA delivery. We get them three weeks out of four. The salads were simple. One made with a handful of greens, some Larriland blackberries defrosted from the freezer, goat cheese feta picked up at England Acres, a few Marcona almonds and a pomegranate vinaigrette. The other, spinach, eggs, mushrooms and a creamy Caesar dressing. 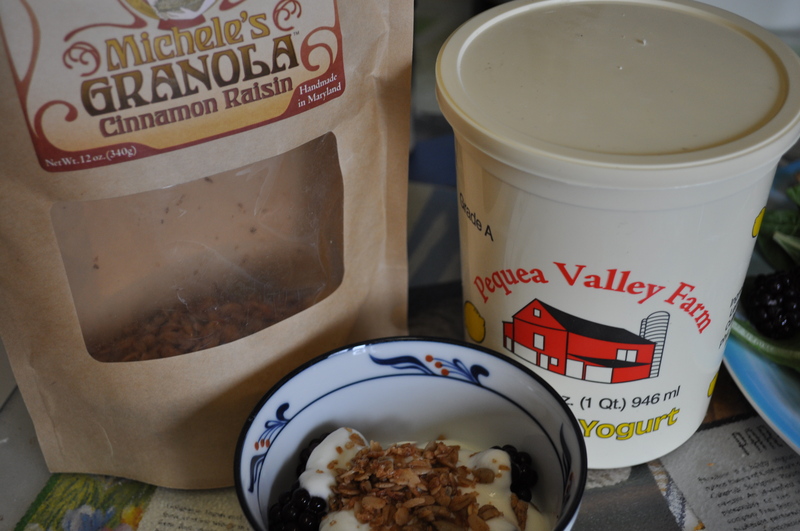 Lunch was finished with a tiny treat of yogurt, berries and granola. A favorite way to use frozen berries from last year’s picking. Mix with a little lemon yogurt. Berries from my freezer, granola and yogurt picked up at Breezy Willow on CSA day. A mostly locally sourced lunch. Variety and taste. Reminiscent of salad bars, without the treated/sprayed veggies, and without all those nasty germs. Posted in CSA, Food, Local Businesses, Locavore, Restaurants, Winter Eat Local and tagged CSA, Food, foodie, local businesses, Locavore, real food. Bookmark the permalink. Agree, too much danger of germs at salad bars these days although I do like the one at Jason’s Deli. Many good toppings and fresh greens, not too much of the high fat premade cheapo things (macaroni salad, pasta salad, 3 bean, etc). But a bout of Norwalk virus (named for an outbreak in my husband’s hometown – Norwalk, OH) would definitely stop me from eating at a salad bar. We had wilted spinach salad tonight with local bacon & the Breezy Willow spinach. And grilled local kielbasa from the freezer. Delicious. Both the spinach and the mixed greens were lovely this week. Steve went on a dawn photo shoot yesterday, I squeezed him fresh orange juice from our Valencia oranges to drink before he left. Hope he doesn’t start to expect fresh-squeezed OJ every morning!! LOL, I have been using the Valencia in orange fennel salad, but juice sounds wonderful. We had kielbo from Orchard Breeze again tonight. Really good kielbo.